Sophsterlicious • UK Blog: - Two Colour Lipstick Loving! It's simple, summery and looks effective! I love this two tone lip look. I used a bright pink on the outer corners and around the edge of the lips, and then just filled in with an orange lipstick. I really like how it looks. What do you think of using two lip colours to create a different look? I love multi tonal lip looks! I did one for a makeup contest and lined my lips with a dark purple, had a lighter purple fill my lips and a hot pink right in the middle, it looks awesome! I think I need to try yours too! What lippies did you use :)? Oooh I love it! This looks gorgeous on you. 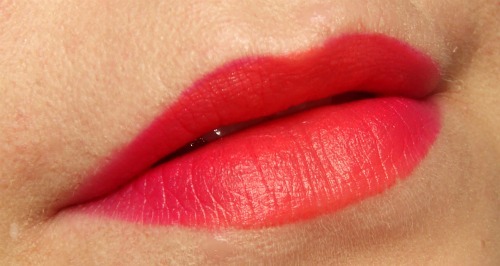 I usually do a two-tone lip with my top and bottom lips different colour, which is a bit garish and obvious. This way is more subtle and pretty! I used bright pink from the hot pink and orange from Barry M. I didn't say the names as you could you any two colours really. I love the look and need to try out other combos.